Wow, that little blog break was unintentional! I can't believe I haven't posted in 3 weeks! And no, Miss Mollie Kate hasn't made her appearance, yet. I've just been working on finishing up her nursery and soaking up my last moments with an only child. The nursery is almost done...I just need to add a few final touches and it'll be ready for the big blog reveal! 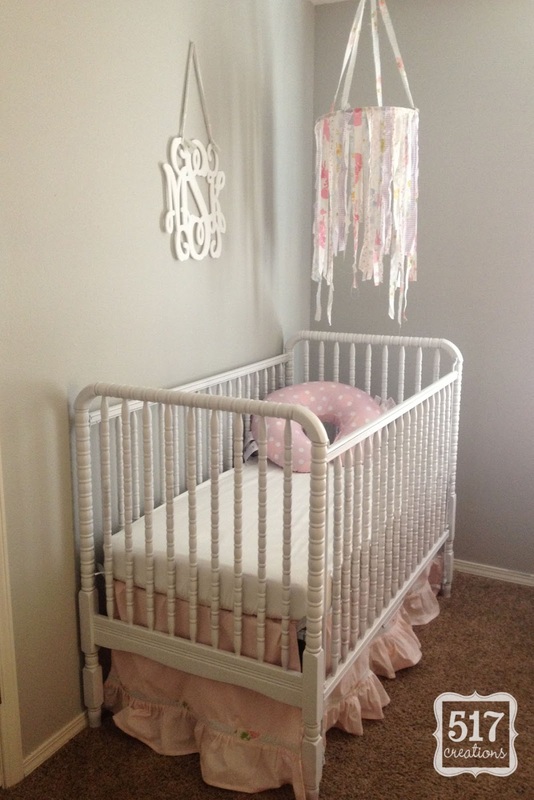 Hopefully MK stays put until her nursery is done! Until then, here's a peek at her crib (remember the before pictures? ), a sweet monogram that you will hear more about soon, and a crib mobile that I made out of vintage sheets and an embroidery hoop! I love it :) so sweet! Hi, what brand is this crib? ?